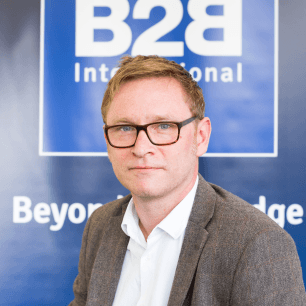 The success of B2B International in recent years has meant constant growth. My role is to guide the operation through that growth while maintaining and strengthening the core values of the business that have made it what it is today. I’m working with a great team in a successful and growing business. I couldn’t ask for more. Challenging and rewarding in equal measure. “A man with a pound in his pocket is a powerful man.” – My Dad (c.1978)… Allowing for inflation it would be at least a tenner. Obviously, the point is that you can achieve a lot with very little. I went inter-railing in my early twenties and the entire journey was an experience which, 25 years later, I remember like yesterday. I met an incredible variety of people along the way but Budapest was the heart of the journey and I spent 10 days there. Barcelona is also a stunning city. Vernon God Little. All I can remember is how brilliantly written it was and how great an impact it had on me at the time. Special mention goes to Feel the Fear & Do It Anyway which taught me that there are no right or wrong decisions, just choices. Watching movies, doing up my doer upper, spending time with my two children and teaching them to clear up their own dishes.